Many times it has been said, “The way to a man’s heart is through his stomach,” I agree, and I can’t imagine a food men love more than burgers. Truth be told I also adore burgers (and fries)...so, this Sunday I created a burger for the boyfriend and me for dinner, and added a little nutrition with a side of broccoli and potatoes. 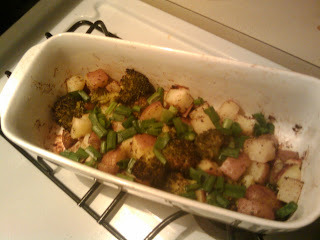 Okay the broccoli was nutrition…the potatoes were just delicious…and for a recipe that hit me as I was laying on the couch recovering from a fun weekend, I was surprised at how well it turned out. This maybe isn’t the best first date meal, as the onion flavor and therefore your breath will be quite strong, but if you and your date have known each other for a while and both love onions try it out…at least you will have onion breath together! Mix Ground Chuck, 2 tbl of the Onion Mix, Garlic Powder, Worcestershire, and salt/pepper with your hands until just incorporated. Do not over mix or squeeze the meat, it will create tough burgers. Divide the meat in half and make 2 patties, wrap patties in foil or saran wrap and refrigerate while preparing onions. Melt butter over low heat in a small pan while slicing the onion into half moons. Cook onions in butter with a sprinkling of Cayenne Pepper if desired, over low heat for about 40 minutes or until caramelized. 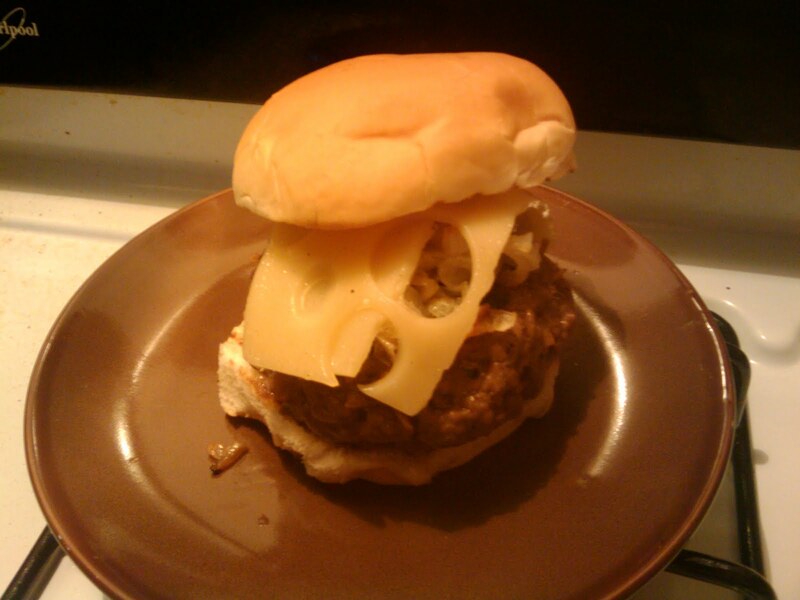 Pull the burgers out of the fridge when the onions have about 15 minutes left so they can come to room temperature. Heat a grill pan or grill over medium high heat. Once preheated, place the burgers on the grill. This is when you want to hear the sizzle; if you don’t hear it the grill isn’t hot enough. Cook burgers on first side for about 6 minutes and flip. Let the burgers cook on the second side for about 2 minutes and then add half of the caramelized onions on top of each burger and top with Cheese. Continue cooking about 3 minutes until burger is done and cheese is melted. If desired toast buns on grill for aabout 2 minutes and then assemble burgers. You may ask, what do I do with the left over onion mix? Well…mix it with 8 ounces (1 Cup) of Sour Cream and you have got a great dip to use in the next couple of days. 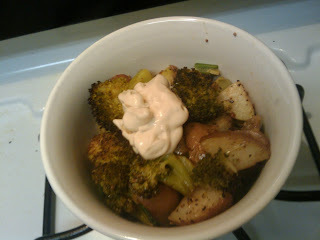 You can put a little dollop on top of the roasted veggies like I did or reserve it and use it with chips or something later on. It will keep for about a week. Preheat oven to 450 degrees. Cut potatoes into small squares, about ½ inch; cut broccoli into florets. Place veggies into a terrine pan, drizzle with olive oil, garlic powder and salt/pepper. Mix veggies with hands to ensure all are evenly coated and roast for about 45 minutes, until potatoes are fork tender and broccoli is sort of caramelized. Put green onions in terrine pan with veggies and put the top on. Let the veggies cool with the top on for about 10 minutes, simultaneously wilting the onions giving all the flavors time to incorporate. If desired, serve in small bowls with a little bit of the onion dip on top. *Generally ground beef is purchased in 1.3 lb packages. If you are cooking for 2 this is way too much meat. Go ahead and buy the larger package, divide in half and freeze the half you aren’t using. This way you have the perfect amount of meat to make 2 one-third pound burgers immediately, and in a week or two you can pull out the reserved amount and create totally different burgers for your enjoyment…all for a grand total of about $7. I would also love to hear from all of you...What are your favorite burger flavors, toppings, etc? And I liked these veggies, but it was nothing compared to classic french fries. I love fries and always prefer them with a burger. What about you?